There are a lot of water bodies with crocodiles in when you are visiting the Northern Territory and careful consideration needs to be taken about that fact before you wander too close to the water. 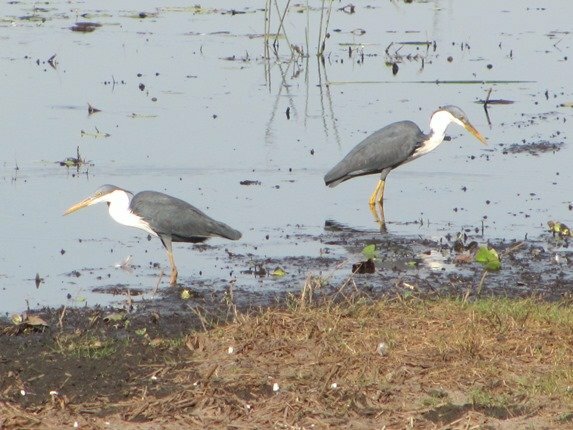 When you are able to find a lagoon that is land-locked and offers great birding and you are able to walk around the edge it is a delight. Although I cycle to Marlow Lagoon daily, it does not offer the expanse that McMinns Lagoon offers. 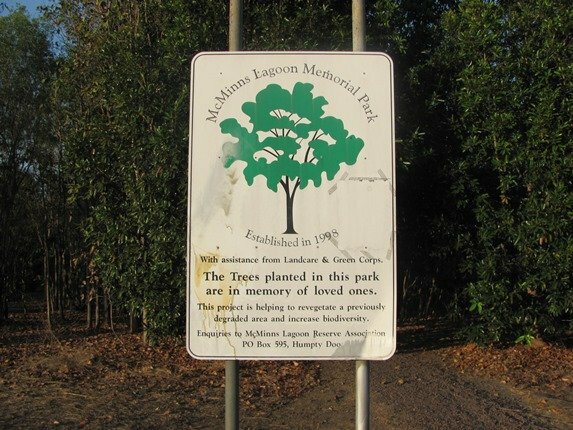 It is not far to travel south to McMinns Lagoon from Palmerston and it can be accessed from a few places. It is first mentioned in a survey of the local area in 1869. The view from Sayer Road used to be very open and offered little protection many years ago and we contributed to the planting of small native trees in 1998 when we lived in Palmerston. The trees are now incredibly tall and are currently flowering offering some great birds. Bar-breasted Honeyeaters that have left Marlow Lagoon appear to have found a new place to feast on nectar here. If you enter the 41 hectare reserve from Paperbark Way you can park in among the trees and walk the short distance to a picnic area situated out on the edge of the lagoon and relax in the shade. 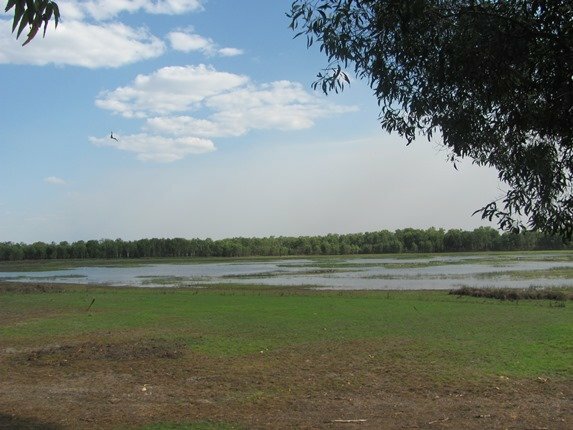 From this area you can then take a walk around the whole lagoon at the moment, though it may not be feasible once the Wet Season rains start to fall and the area floods more. It would still offer excellent birding opportunities from the picnic area. 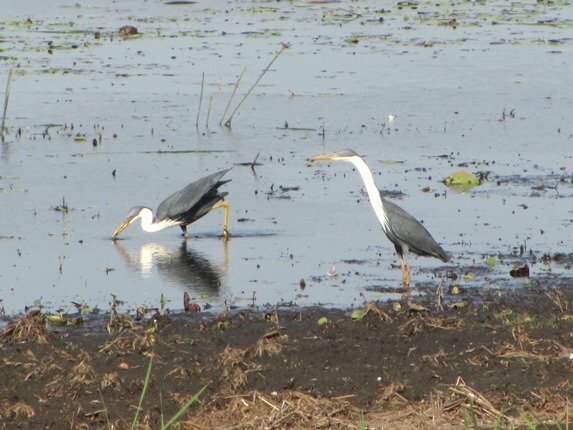 On our first visit a few weeks ago it was getting late when we arrived and the numbers of birds were concentrated in one area and we watched hundreds of Pied Herons fly over to go somewhere else for the night. 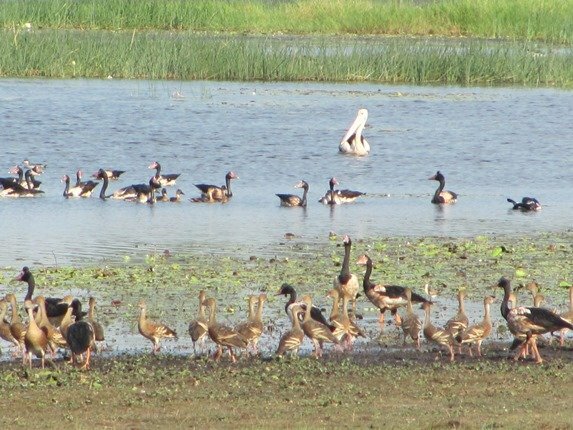 There were good numbers of Green Pygmy-geese, Comb-crested Jacana, Great and Intermediate Egrets, Magpie Geese and a family of Black-necked Storks. 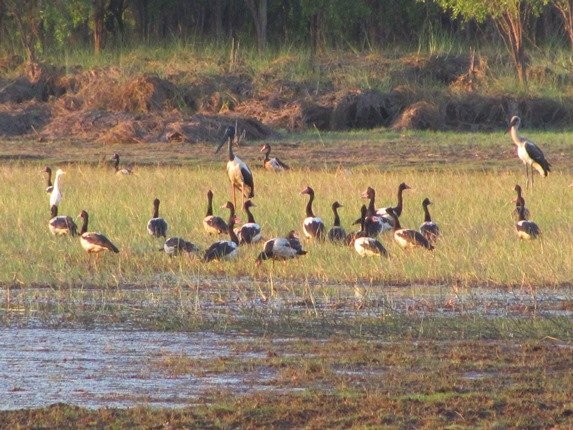 The female Black-necked Stork has a yellow eye and was closer to the juvenile bird. There was a lot of disturbance, with almost everything taking flight, as a pair of White-bellied Sea Eagles soared over the lagoon on dusk. When we returned to McMinns Lagoon this last weekend we arrived earlier and we could walk all the way around the lagoon before it went dark. We walked from the picnic area anti-clockwise and the view from the other small picnic area off Lily Lane back to the larger shadier picnic area offered more Magpie Geese than there had been on the last visit. 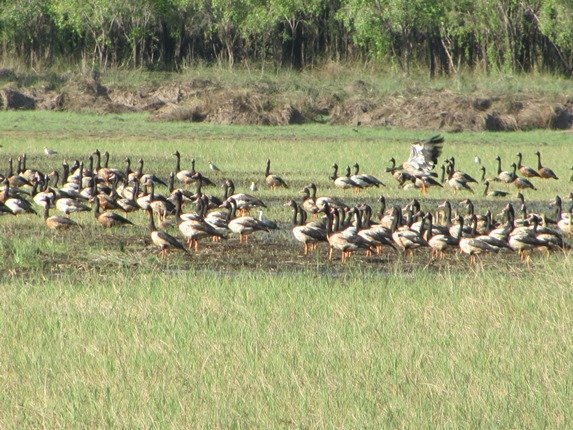 Wildfowl hunting season has recently started in the Northern Territory and no doubt there are a few Magpie Geese that have decided to move here rather than get shot at in the hunting reserves. 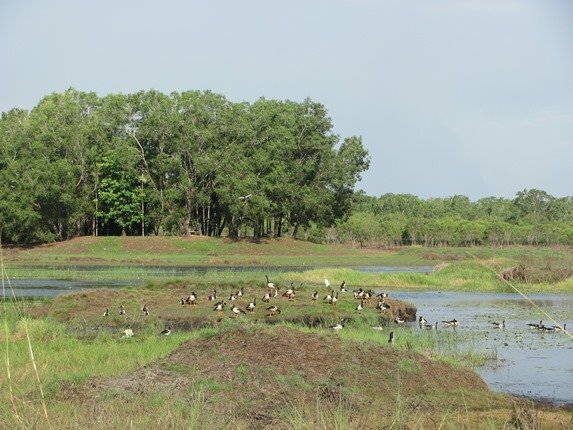 We continued along Scotty’s Walkway around towards the tall trees that we had helped plant n 1998 and there was a flock of Plumed Whistling-Ducks and a few Wandering Whistling-Ducks among them. 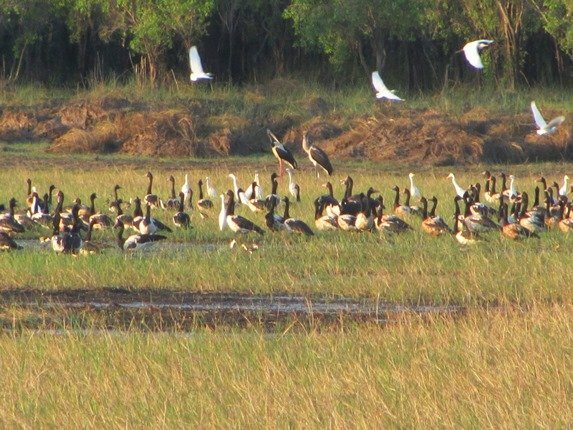 There was only the one Australian Pelican present and a pair of Royal Spoonbills and the constant annoying racket from the Masked Lapwings! 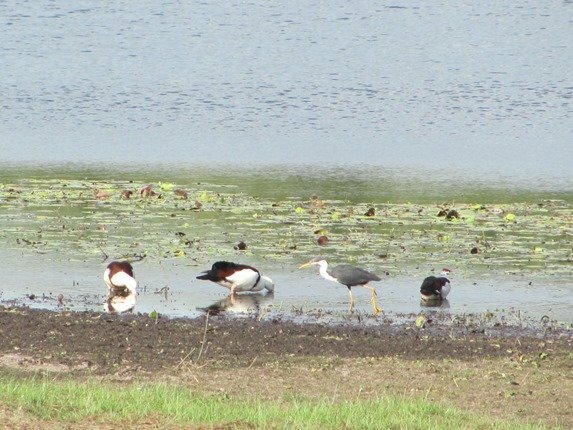 Radjah Shelducks were favouring one area for feeding as we walked by and there was a Pied Heron taking advantage of the stirred up mud. 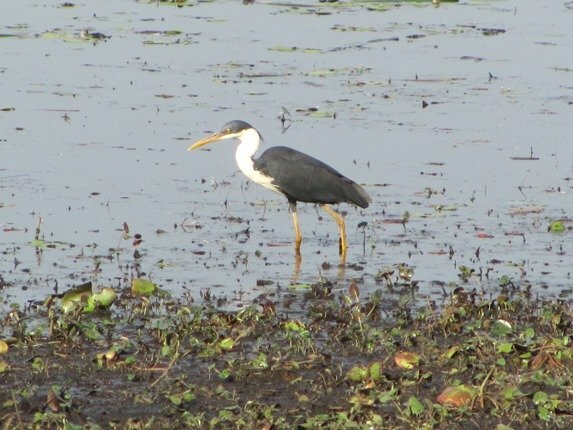 The Pied Herons were favouring the edges as we continued around the lagoon and were doing well at finding food. They really are a “smart” looking heron! 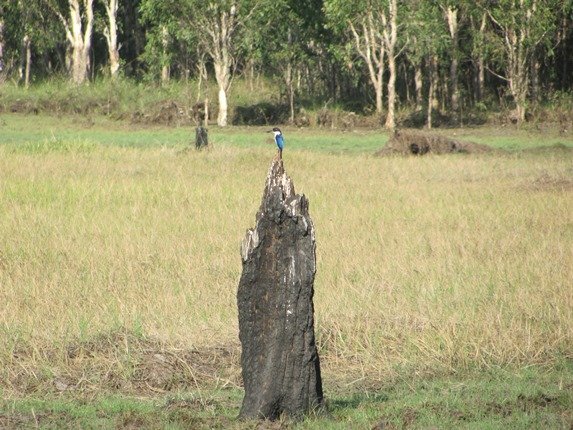 There have been bush fires in the area over the years and the remaining stumps are useful to Forest Kingfishers. This has to be a poorly camouflaged bird if ever there was one! 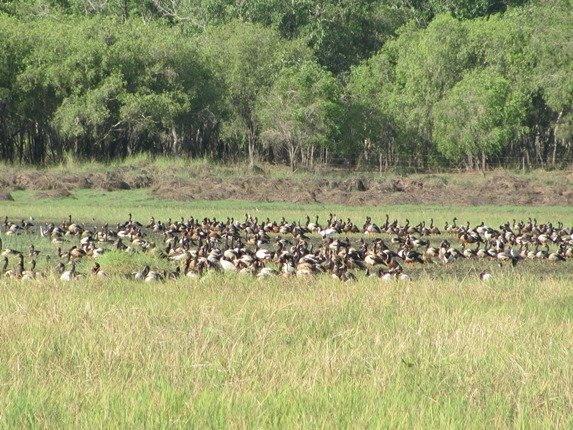 The highest concentration of Magpie Geese was on the east side of the lagoon and there were huge numbers. No doubt they will be staying in this excellent spot for quite some time…unless they want to risk becoming dinner! There were about 50 Red-tailed Black Cockatoos arriving as we left and this truly is an excellent place to bird. 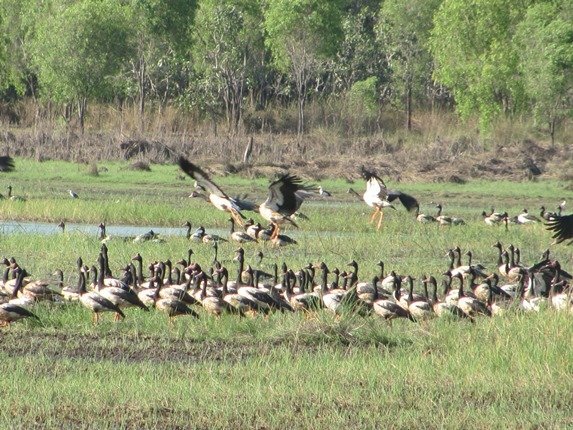 If you don’t have time to get to the world famous Kakadu National Park there are still excellent birding opportunities close to the city. My goodness, what a fantastic lagoon! Where Are You Birding This Second Weekend of August 2014?